February 15, 2018 (San Francisco, Ca) -- Planisware, the leading global provider of Project and Product Portfolio Management (PPM) software solutions for new product development (NPD) and engineering organizations, today reported a total revenue of $70 million for the fiscal year 2017, for an 18% year-over-year increase in revenue. The milestone marks the fifth straight year of double-digit growth for the organization. New implementations in 2017 included Huawei, Hydro-Quebec, Johnson & Johnson Medical Device, Hager, McDonald’s, AirLiquide, Catapult, Ipreo, Merck, and Dainippon Sumitomo. Planisware continues to establish its PPM leadership in NPD by serving more than one-third of the top 100 R&D spenders worldwide and expanded its footprint in project control and engineering, IT, and mid-market NPD with the addition of several new customers. The company also grew its global presence by adding offices in Manchester (U.K.), Montreal (Canada) and Boston (U.S.), and experienced significant expansion in its Tokyo (Japan) and Denver (U.S.) locations. A majority of new customers selected the Planisware Live offering – the company’s SaaS solution – benefiting from the full-service PPM tool’s fast implementation time, affordability and the Customer Success Management program. The program assigns Planisware Live customers to a Planisware representative who is dedicated to the ongoing success of each company’s ongoing PPM objectives. Planisware’s differentiated PPM solution was noted by several top analyst firms – including Gartner and IDC – and Forrester Research named Planisware a leader in “The Forrester Wave™: Strategic Portfolio Management Tools, Q3 2017.” Additionally, Planisware was the first PPM vendor to achieve Stage-Gate International’s new Innovation Team Agility certification, which requires that a solution provider includes the workflow configuration, user interface and collaboration capabilities necessary to enable teams to execute product innovation with greater agility, flexibility, and speed. In terms of product evolution, Planisware upgraded its cloud service offering by creating tighter integration with popular tools like Microsoft Office Suite and G-Suite, enhancing its Agile for project management capabilities, and delivering new features for business intelligence tools. The Planisware Center for Excellence continued to deliver best practice education throughout the year, with several webinars and masterclasses in the U.S. and Europe led by thought leaders like Dr. Robert G. Cooper, Dr. Richard Bayney and Johanna Rothman. Planisware also held its PPM Best Practices Tour in 2017, comprised of events in Boston, Detroit, Chicago, Montreal, Minneapolis, San Francisco and Cincinnati. The organization’s User Summit North America in May assembled more than 250 PPM professionals and thought leaders from 80 organizations around the world, and user summits in Paris and Germany drew 350 and 100 PPM professionals, respectively. 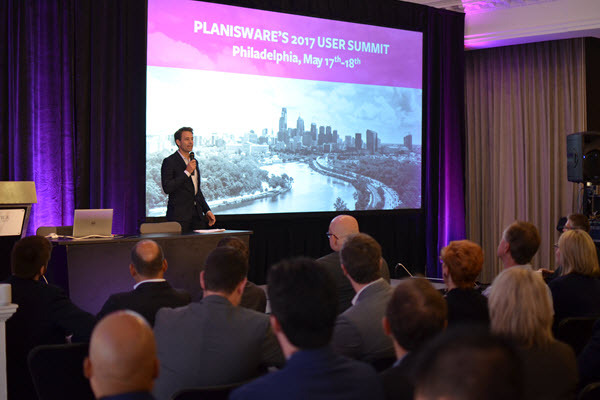 Planisware is primed for continued success in 2018 and remains committed to fostering a strong user community with events such as its North America User Summit this May 16-17 in San Francisco and regional best practice meetings throughout the year. The European operations will also host user summits in Germany in June and Paris in November.